Reviews of the Canon PowerShot D30 from around the web. Canon's latest waterproof compact follows on from some impressive predecessors, but can it match their performance both in and out of the water? 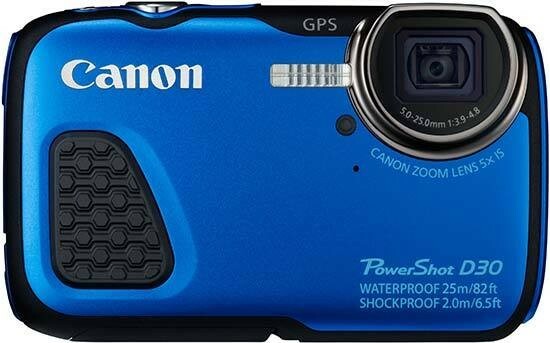 The Canon Powershot D30 is a waterproof, freezeproof and shockproof digital camera, with a wide-angle 5x optical zoom lens, a 3inch screen and geotagging via built in GPS. The Canon PowerShot D30 ($329.99) is, from an imaging perspective, a very minor update to the older D20. Its lens, 12-megapixel image sensor, and image processor are the same, which is to say they're a couple of years old at this point. The real selling point of the D30 is its ability to survive the pressures you encounter at an 82-foot underwater depth—that's the best in this class by a good 20 feet.